Do buildings have the power to heal us? Responding to increasing concern for the effects of design and architecture on our overall wellbeing, Happy by Design: A Guide to Architecture and Mental Wellbeing examines how we can build happier, healthier spaces, from the ground up. 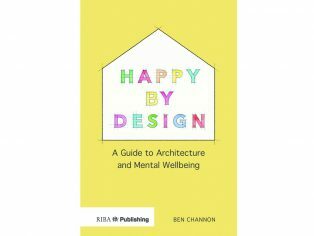 Published by the Royal Institute of British Architects (RIBA), Happy by Design aims to inspire and motivate architects to design for the human experience, while also appealing to the wider public. Through a series of design tips and hand-drawn diagrams, this accessible guide can be used by everyone from employers looking to boost office morale or homeowners looking to DIY their way to a happier home. As Mental Health Ambassador and senior architect at London architectural practice Assael, Ben’s relationship with mental wellbeing in design is both personal and professional. During the final part of his architectural studies, his mental health took a turn for the worse. From this experience, he realised that mental health issues are universal and that anyone can find themselves struggling. Since then, he has worked tirelessly: researching and designing buildings that will improve people’s mental and physical health. The result is Happy by Design.